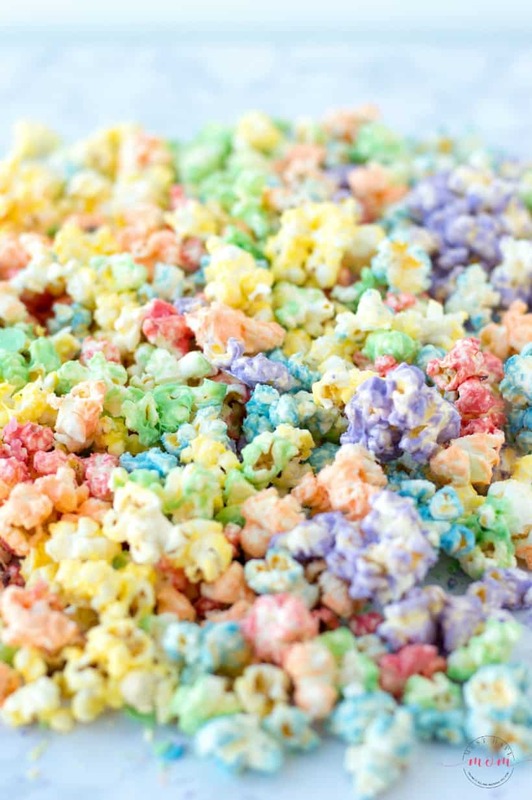 This rainbow popcorn is so colorful and tasty which makes it perfect rainbow party food! 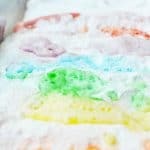 Whether you’re hosting a rainbow party or you just want a fun snack to serve the kids, this rainbow jello popcorn recipe is the BEST one out there so be sure to bookmark this page or pin it for later! When I was little I used to have a favorite popcorn store in the Mall of America where they served colorful, flavored popcorn in the BEST flavors. It was always the treat I chose and I was so sad when the store disappeared from the mall. Now as an adult I attempted to recreate that rainbow popcorn from my childhood and I’ve done it! This rainbow jello popcorn is colorful, flavorful and tons of fun. 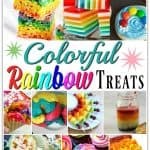 It’s perfect rainbow party food and will always elicit ooohhs and ahhhhs from the kids as a special treat! 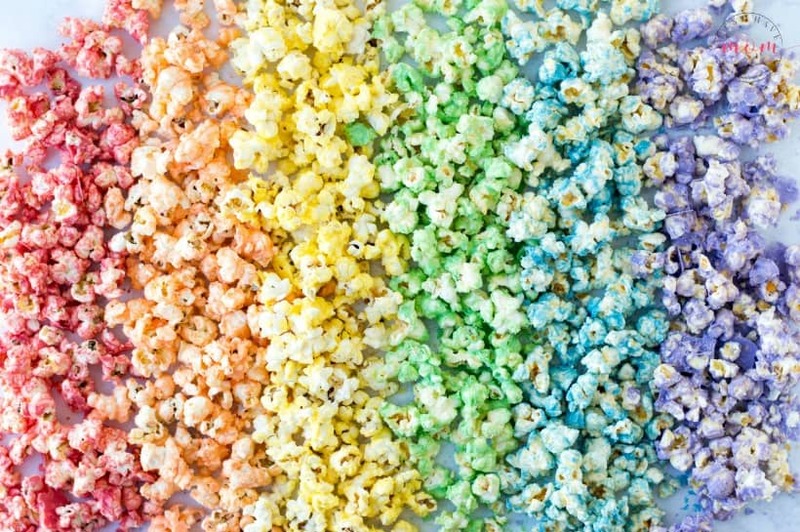 If you love this rainbow popcorn then you might also be in search of other rainbow inspired foods! Be sure to check out my hugely popular rainbow jello and rainbow jello frosted grapes too! So good and pretty too!! In order to get the bright colors and rainbow of flavors that make up rainbow popcorn, we use Jello! Now don’t get crazy, you won’t be making the Jello itself, but instead will be using the Jello powder as the color and flavoring for your popcorn. Cool right?! 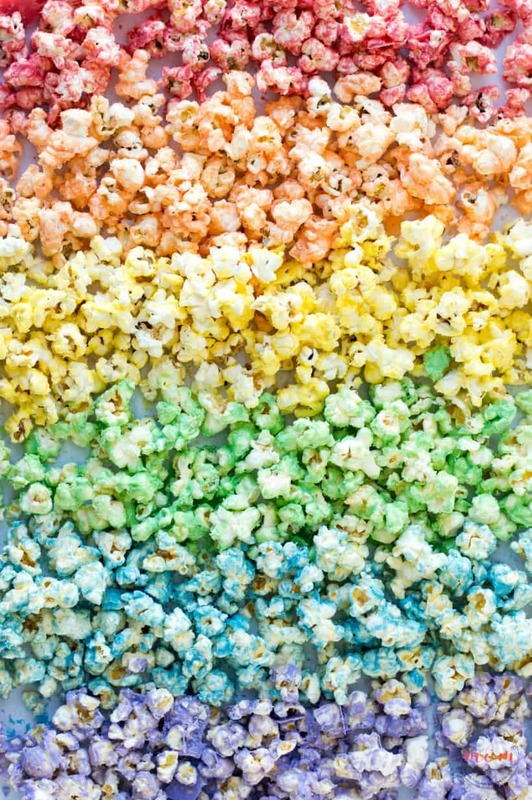 Here is how to make rainbow jello popcorn! Begin by popping popcorn. You’ll need 10 cups of popped popcorn (Amish popcorn is our hands-down favorite kind) which can be popped using an air popper or however you prefer. Preheat oven to 300 degrees Fahrenheit. Line a cookie sheet (these are my favorite ones that I use) with parchment paper (I buy the precut sheets to save time and waste less). Spread popcorn out on top of the parchment paper and set aside nearby. Grease a 2-quart saucepan with butter to prevent the mixture from sticking. Combine 1/2 cup butter, 3/4 cup sugar, 1 (3oz) package of Jello, 1 tablespoon corn syrup and 3 tablespoons of water. Heat until it boils and then continue to boil for about 3-4 minutes or until a drop of hot mixture dropped into a cup of cold water forms a rigid ball. Pour mixture over popcorn and stir until evenly coated. Put popcorn pan into oven and bake 5 minutes. Stir and bake an additional 5 minutes. Remove from oven and spread on top of parchment paper to cool. Once it cools, break into clusters. Repeat for each color of the rainbow. 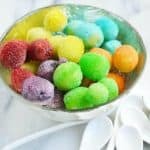 You can also make rainbow popcorn balls with this recipe! Follow the same recipe directions, but instead of allowing the popcorn to cool completely, allow it to cool until it is not too hot to handle with your hands. Then grease your hands and form the popcorn into balls. You can make different colored popcorn balls and then form a rainbow with them! Once formed in balls, allow to cool completely. 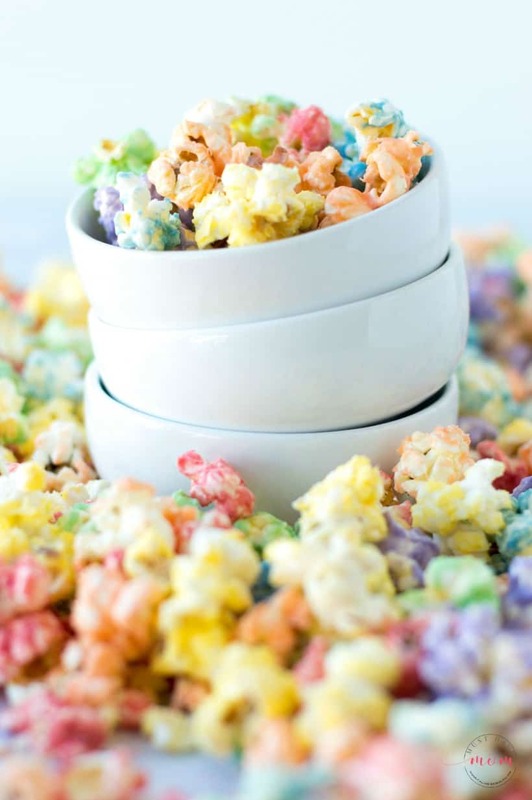 Store your rainbow jello popcorn in an airtight container in a cool, dry place. We like to store ours in an airtight jar on the counter because it’s so pretty! Rainbow popcorn balls can be wrapped individually in clear plastic wrap and tied shut with a colorful ribbon. They make pretty rainbow party favors or St. Patrick’s day snacks too! 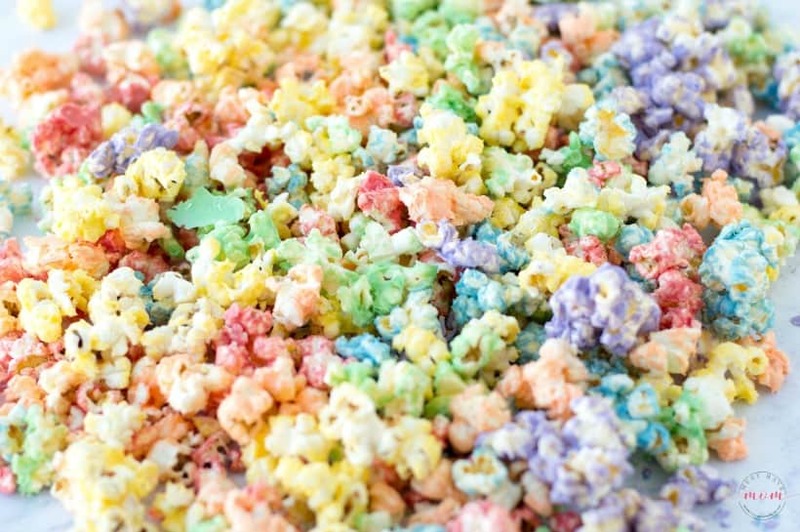 This rainbow popcorn recipe is made using Jello for color and flavor. 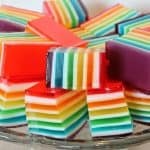 It's delicious and colorful and perfect for rainbow party food! Begin by popping popcorn. You'll need 10 cups of popped popcorn (Amish popcorn is our hands-down favorite kind) which can be popped using an air popper or however you prefer. Preheat oven to 300 degrees Fahrenheit. Line a cookie sheet with parchment paper. Spread popcorn out on top of the parchment paper and set aside nearby. Grease a 2-quart saucepan with butter to prevent the mixture from sticking. Combine butter, sugar, package of Jello, corn syrup and water. Heat until it boils and then continue to boil for about 3-4 minutes or until a drop of hot mixture dropped into a cup of cold water forms a rigid ball. Pour mixture over popcorn and stir until evenly coated. TO MAKE POPCORN BALLS: Follow directions until you spread mixture to cool. Allow to cool until you are able to handle them with your hands. Grease hands and form popcorn into balls. Allow to cool completely once formed into balls. Store in an air tight container in a cool, dry place. For popcorn balls, wrap individually in clear plastic wrap and tie shut with a ribbon. *This recipe makes ONE color popcorn. Repeat recipe (and ensure you have enough ingredients) for each color of the rainbow. Is Rainbow Jello Popcorn Gluten Free? If you are following a gluten-free diet or have a condition such as celiac disease, you’ll need to closely monitor the ingredients you chose. We used Amish popcorn in this recipe which is gluten-free. The other ingredients are also gluten-free, however, the Jello does not specifically state it is gluten-free and while it doesn’t appear to contain gluten, we suggest using your own discretion. If you are able to find a labeled gluten-free gelatin powder that is flavored you can substitute that in equal amounts. 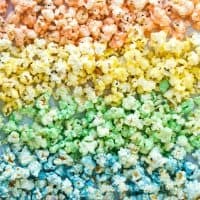 Where Can I Buy Rainbow Popcorn? 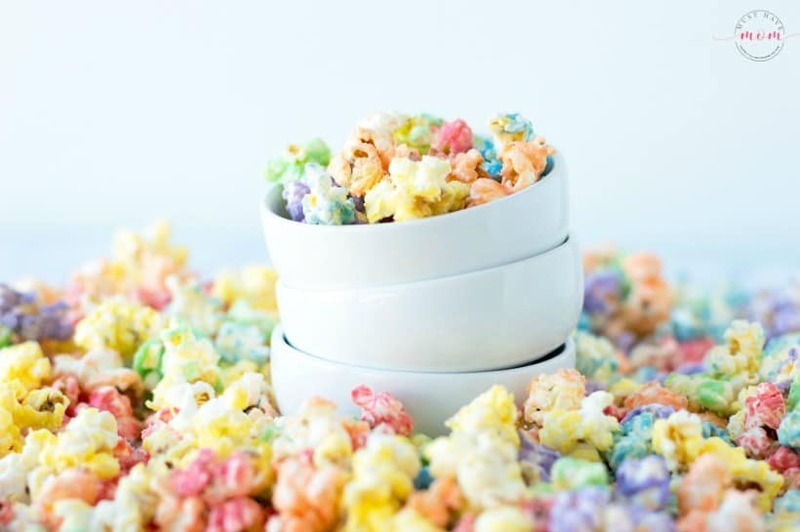 If this rainbow popcorn recipe sounds like more than you wish to tackle then I suggest buying rainbow popcorn for your event or party instead! You can buy rainbow popcorn on Amazon at relatively low prices and this one even includes a popcorn scoop! « Transform Bedtime With The Best App For Kids + Win Family Manhattan Vacation Giveaway!